LIBERAL, Kan. – In what has become a trend, the No. 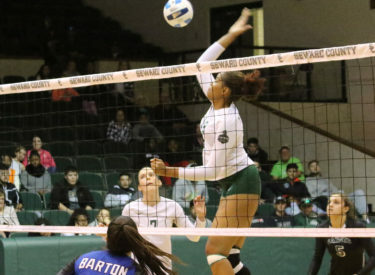 9 Seward County volleyball team came away with another sweep of a conference opponent, taking down the third-place Barton Cougars 25-20, 25-16, 25-18. The win pushes Seward to 22-5 overall and 11-0 in conference play, while head coach Tony Trifonov earned his 400thcareer win as a collegiate head coach, putting him among the elite. It was a tough start for the Lady Saints, as Barton (17-12, 7-3 KJCCC) led 4-3 through the first seven points. A quick three-point run coming off two Luz Sierra kills and a Djuly Schmorantz kill put Seward on top for the first time in the set, but it quickly faded as the Cougars took control midway through the set. Trailing 16-13, the Lady Saints turned up the heat on Barton, winning seven of the next nine points to take a late 20-18 lead. With Seward still leading by two points at 22-20, the Cougars called a timeout, but it was all-for-not as the Lady Saints ended any thought of a comeback with three straight points, winning 25-20. The second set was all Seward County, winning four of the first five points on the board, with Barton’s only point coming from a service error. The Cougars would cut the lead to two points at 8-6, but the Lady Saints wouldn’t give in, keeping their distance until a 5-0 run pushed the score to 19-11 in favor of Seward. That run gave the Lady Saints the breathing room needed to finish the set, winning in commanding fashion, 25-16, to take a two-set lead. Trying to come away with their seventh conference sweep of the year, Seward wasted no time, taking an 8-2 lead as the reining NJCAA National Player of the Week, Luz Sierra, took over with four points to begin the set. The Cougars wouldn’t give though, fight back to make it just a two-point game at 20-18. Needing just five points to complete the sweep, the Lady Saints used four different players to come away with the win, ending the set on a 5-0 run with points coming from Thais Vieira, Laura De Pra, Sierra and Tapigliani to win 25-18 and complete the sweep. Seward was once again led on offense by Sierra, who finished with a .647 attack percentage, landing 11 of her 17 attacks for kills. She added three emphatic blocks on the defensive side. Schmorantz was tied for a team-high 11 kills in the match. Eight different Lady Saints finished with at least one dig, led by Nathiellen Machado’s 13 digs. Schmorantz and Asia Jhun each came away with seven on the night. Seward will have the weekend off but will travel to Great Bend on Monday for an immediate rematch with the Cougars. The first serve will be at 6:30 p.m. in the Barton Gymnasium. ©2019 Seward County Broadcasting Company, Inc.